Lebanese food is usually quite friendly for those who want to take care of themselves: most of their dishes have many vegetables, grains and legumes, which makes them ideal for maintaining a balanced diet. One of the salads most recognized in the gastronomy of Lebanon, is the Tabule. 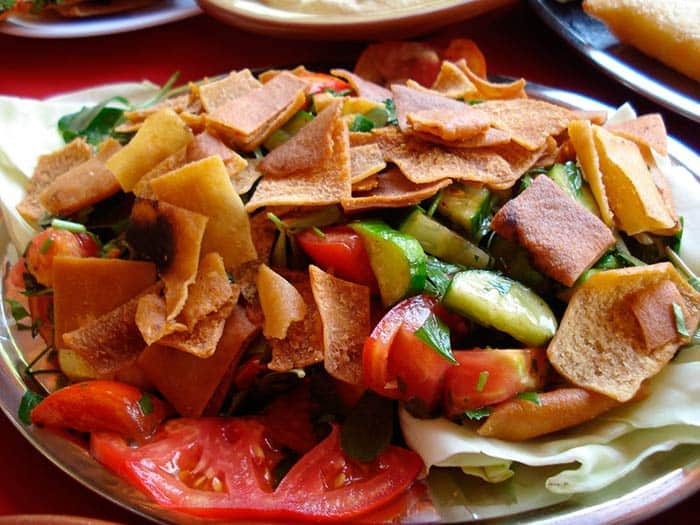 But personally, my favorite has always been the fattoush salad or fattush salad . Why? Its preparation is much faster and for a girl with a busy schedule, this is more or less equivalent to a blessing. The only detail with this delicious Arabic salad is that one of its star ingredients, which brings a rich flavor with a mixture of sweet and salty, an attractive golden color and a divine ... crunch !, fried pita bread that, if you are on a diet, you can replace it with something healthier. For example, toasted whole wheat pita that honestly remains divine. 50 grams of whole pita bread or 3 portions of these. Three Tablespoons of Zaatar: This ingredient can be obtained at any Arab food store. First, start by toasting pita bread. Make it in the microwave and place it in pieces on a glass plate. It is important that they are not one on top of the other, put them side by side because otherwise they stick. Heat for a minute, touch them and feel if they are toasted, if not, place them one more minute until they are crispy. Each microwave is different, in mine for example took two minutes to toast. Then cut the vegetables, the lettuce in medium pieces, the tomatoes and the cucumber in medium squares (calculate that you can puncture them with the fork). Onions and radishes should be chopped in julienne. Separate the leaves of mint and parsley and cut them a little smaller. Mix everything. Once mixed, add the lemon, zaatar, salt and pepper to taste and finally, crush the pita bread in medium pieces and place it, mixing everything. 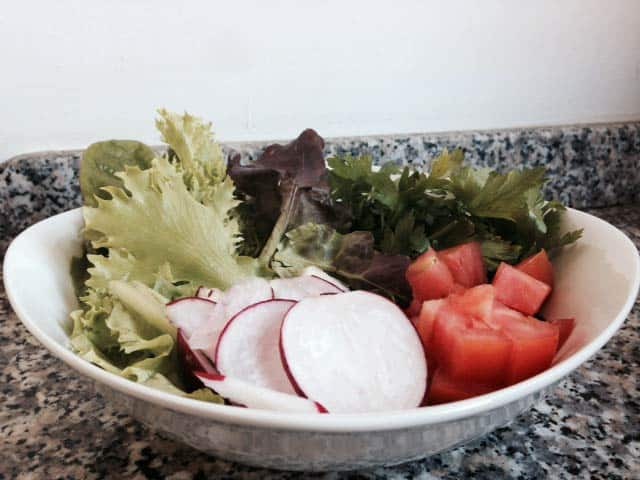 The zaatar is salty and a little acid, it is important that you first try the salad with everything before placing the salt , because you may feel you do not need it. If you do not like to eat pita bread, you can replace it with paleo pita or eggplant chips. 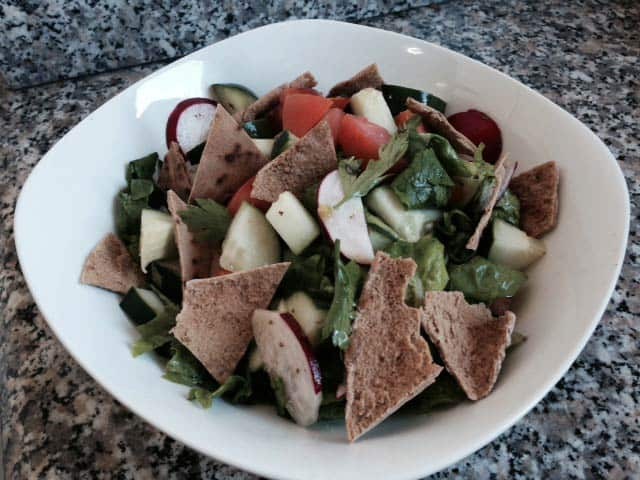 your lunches or dinners, a light snack or a meeting between friends or family, without a doubt, the Fattoush salad is a rich and quick healthy recipe. I give you some ideas: You can prepare a delicious grilled salmon, and accompany with this salad. You can also make a nutritious first-course noodle soup, and secondly, the aforementioned Lebanese salad. One last idea: make two salads, this recipe and a potato salad.